10cm body length 20g. Length: Approx. 10cm / 4in. Excellent slow sinking life-like swimming actions in water to provoke predators to bite. Technique: Casting & Trolling. Because we ensure that the quality of our plastics are strong and durable with the perfect imitation to fool the wariest of fish. Deep diving Fishing Lures. allow for slight colour variation due to monitor settings. all sizes and weights are approx. (2.5m-5.5m approx.). The colours and patterns you will receive are as pictures. 10 Pcs Alloy Fishing Baits. The real color of the item may be slightly different from the pictures shown on website caused by many factors such as brightness of your monitor and light brightness. Perfect design can increase your catches and create more fun. Material: Copper plastic Color: Blue. Bright and colorfulplating is colorfast and the sequins can reflect light underwater to lure fish. 12 x Fishing Lures (with Box). The hook is sharp and high strength, firmly connected to the lure and has great force. 1 x USB vibrate fishing lure. Vibrate in the water, life-like swimming actions, more easy to fish. LED flash light in dark, more easy for the fish to find it. Life like, more easy to attractive to fish. Our fishing lure baits are made of ABS plastic. They create life-like swimming action in water. Bright colors are good for you to catch fish. Suitable for Saltwater & Freshwater fishing. Swimming action enchanting, attract fish easily. 1 x USB vibrate fishing lure. Vibrate in the water, life-like swimming actions, more easy to fish. Life like, more easy to attractive to fish. Can figh big and heavy fish. 3D Fish Eyes: Big and bright eyes. This fishing lures is smooth and rapid diving action. Depth: Floating depth for Top water fishing. Floation/Topwater fishing lure. Type:Artificial Bait. 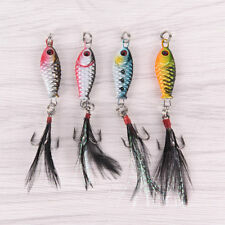 1pcs fishing lure. Be careful when you outdoor fishing, also be careful when you use the hook. Depth: Floating depth for Top water fishing. Floation/Topwater fishing lure. Type:Artificial Bait. This fishing lures is smooth and rapid diving action. 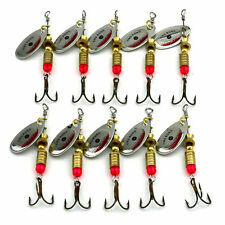 1pcs fishing lure. Be careful when you outdoor fishing, also be careful when you use the hook. 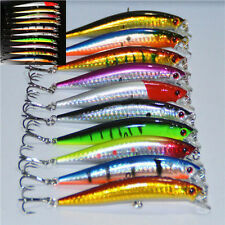 10 Pcs Alloy Fishing Baits. Perfect design can increase your catches and create more fun. The real color of the item may be slightly different from the pictures shown on website caused by many factors such as brightness of your monitor and light brightness. 1 x USB vibrate fishing lure. Vibrate in the water, life-like swimming actions, more easy to fish. USB Rechargable LED Light Flashing Twitching Fishing Lures Bait Electric Life-like Fishing Hooks. LED flash light in dark, more easy for the fish to find it. Floating Minnow Fishing Lures. allow for slight colour variation due to monitor settings. all sizes and weights are approx. With Internal Rattle. This fishing lures is smooth and rapid diving action. Depth: Floating depth for Top water fishing. Floation/Topwater fishing lure. 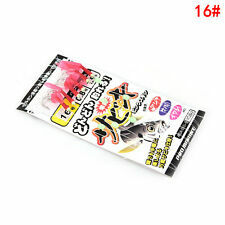 1pcs fishing lure. Be careful when you outdoor fishing, also be careful when you use the hook. 25g weight will sink into water easily. Weight: 25g. 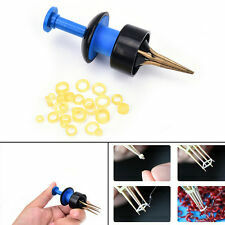 With this bait,you will catch your fish easily. Artificial and high simulated. Reflective and shiny surface will highly attract fish. (Hooks and Feathers in the picture are not included!). 2 strong treble hooks. Suitable for different kinds of fishes, wonderful tool for fishing lovers. Material: ABS. Durable ABS material contributing to long service life. Life-like swimming actions in water to provoke predator to bite. Hook: High Carbon Steel Treble Hooks. 4× Fishing Lures. The color and brightness may differ a little for the difference of shooting facilities, computer display screens or other factors. Your understanding is so appreciated. 25Pcs/Lot Soft Bait Shad Worm Crawfish Shrimp Bass Pike Fishing Lures Equipment. Jointed Diving Minnows. Bulk Buy Deal. between 7g and 8g weight each. Suitable for different kinds of fishes, wonderful tools for fishing lovers. Size:as the pictures shows. Stunning laser printed real Jack Pike, NATURAL STRIPED MULLET JACK, 20.5cm 70g sinking, made up of 8 sections with tough silicone fins, long cast lure sinking to any depth, smooth rattling swim action just like the real thing. Stunning laser printed real Jack Pike, TOXIC PALE JACK, 20.5cm 70g sinking, made up of 8 sections with tough silicone fins, long cast lure sinking to any depth, smooth rattling swim action just like the real thing. Most reels are bought in striped cleaned and serviced so most reels are reconditioned and sold as reconditioned apart from when it states new. Diving depth: topwater. Weight: 15g. Type: Soft Lure. 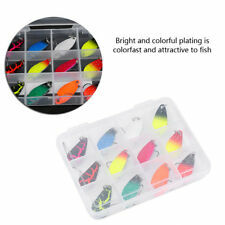 5 pcs fishing Lure 1pc box. Color: 5 colors available. LIFELIKE MULTI JOINTED PIKE FISHING LURE. TWO STRONG TREBLE HOOKS. HIGH RESOLUTION BODY DETAIL. 10 Pcs/Set Metal Fishing Baits Metal Dot Pattern Spinner Lures with Hook"
6 Mix Black Silver 5″ Minnow Plug Lure Crankbait. All Equipped with Strong NSB plated treble sharp hooks. 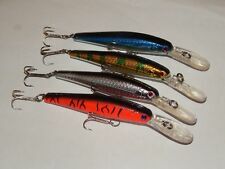 Up for sale are 6 hard baits from our hottest products, they are must have for your fishing tackles.